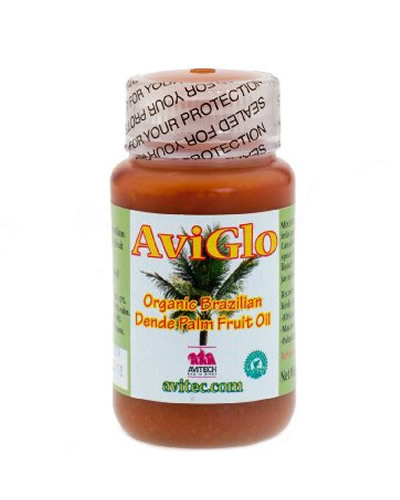 Avitech AviGlo Red Dende Palm Oil helps birds with dry skin and feet, and helps put sheen into birds with dull feathers. AviGlo 100% Organic Palm Oil contains a number of essential fatty acids and is great for all birds, especially Greys, Macaws, and Cockatoos. It is packaged in special plastic bottles containing no PBA's. Use by adding to food or offering on spoon. How to Use: The best way to use it would be to warm the bottle of AviGlo in water at about 80 to 85 degrees F until the oil liquefies. The oil can then be mixed with regular foods. For young birds or sick birds, feed 1 or 2 drops per 3 ounces of body weight. Notify me when 16oz AviGlo Red Dende Palm Oil - Avitech is in stock.